Thrive is a therapeutic approach to help support children with their emotional and social development. Research has shown that how we behave is linked to how we feel and our emotions are linked to how we learn. By teaching children to recognise and notice these feelings and emotions it can help with their development and learning. Children sometimes need some extra support with their emotional growth and this can be temporary or over a longer period of time. Why might my child attend a Thrive session? Difficult in unstructured sessions such as playtimes. Finding it hard to settle in the classroom. Finding it difficult to manage their strong feelings. Not knowing who to turn to when feelings are too big to manage on their own. These situations can lead to many different feelings which may seem overwhelming at times. They might include: anger, frustration, sadness, loneliness, confusion or anxiety. All these feelings are very normal and happen to a lot of children. The Thrive sessions are to help children learn to manage their feelings and teach them strategies that will help promote their learning at school. 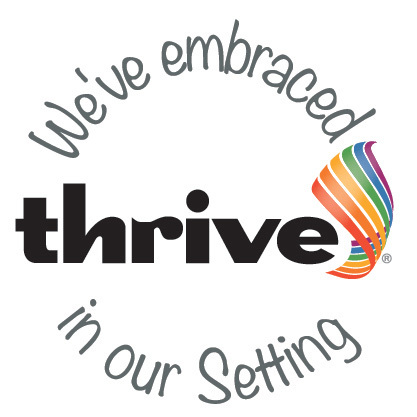 What will happen in a Thrive session? Provide alternative support for children who are experiencing emotional, social or behavioural difficulties. Provide a safe and calm environment for children to develop their skills. Enable children to take pride in their achievements and enhance self-esteem. Help children to manage their feelings and develop skills to enjoy and participate in school life. Use positive approaches to manage all behaviours. For more information about the Thrive approach please book an appointment with Mrs Creasey or Mrs Blowers.